People who volunteer their time and expertise believe they have something valuable to offer. That being said, you may find it quite distressing to learn that your services however expert they may be, are worth a tax deduction of precisely zero. This rule is not unique to volunteer work; in fact, it is consistent with other tax laws. With only isolated exceptions, the general rule is that you must use your cold, hard cash or give items away before you may claim a deduction. The cost of a required uniform and the cost of keeping it clean, and telephone expenses. If the organization you volunteer with reimburses you for any expenses you may not take them as a tax deductions too, that’s commonly referred to as double dipping. Some local travel expenses are also deductible, such as bus, train, or taxi fares. If you use your own car, you may deduct the parking fees, tolls, and cost of your gas and oil for those miles you travel for the charity. You may not deduct the cost of insurance, maintenance, registration fees, or depreciation, as you could if you were using your car for business. If you don't want to keep track of your actual gas and oil expenses, you can simply keep a log of the miles your travel for volunteer work and deduct the IRS rate per mile, which for 2014 is 14 cents per mile. 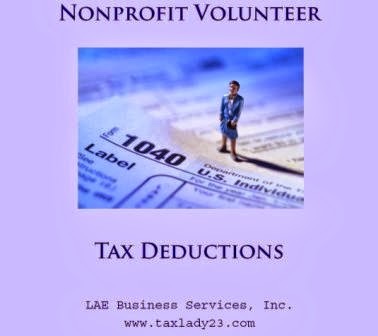 Your organization must be a qualified, IRS-recognized charity. The expenses can't be personal, for family, or for living items or activities (such as meals for children while they accompany the volunteer to a convention). With any tax advice you should always consult your tax professional. And if you want some light reading check out IRS Publication 526, Charitable Contributions, at www.irs.gov, then click on publications. Please email us at info@laebusiness.com if you're in the market for a new tax professional.